Air Show Success – Sky rocket your air show ticket sales! Air Show Success – Sky rocket your air show ticket sales! Learn 10 Secrets to Organizing Sell-Out Air Shows! 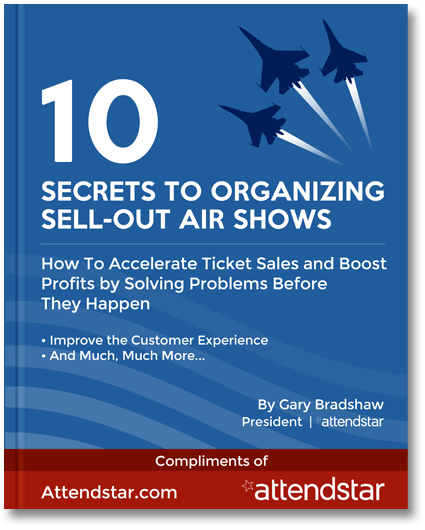 Get the FREE 10 Secrets to Organizing Sell-Out Air Shows guide, and learn how to accelerate ticket sales and boost profits using proven tactics that sove problems before they happen. Written by an air show ticketing expert, this book is filled with 11 chapters of easy, step-by-step guidance, critical warnings, and essential tips, so you can master air show planning and ticket sales. AttendStar is giving this must-read guide to you for free, but that's not all! You'll also find a special link to download your own FREE 12-Month Air Show Planning Checklist inside the book. Just enter your email address to get the free guide and checklist! Get your copy today and start selling out your air shows! AttendStar.com ©AttendStar LLC. All rights reserved.